This is an ongoing story about my back and my body and yoga. It begins on Jan 24, 2009. Scroll back to that date if you want to begin at the beginning. Otherwise, just jump in. In 1996 the Spondylolithesis had become sufficiently pronounced to limit my life. I was managing to get to work everyday and do the fundamentals of my job, but I wasn’t doing all the other parts of my life that kept me vibrant. My family, friends, home and spiritual life were bearing the brunt of my disability. I had used yoga and exercise to keep the condition manageable for most of the preceding decade. Having two young children and a 60-hr/week job left no time for self care. The pregnancies and childbirth pushed my back to the edge. I was hiking one day in 1996 with my son in a back pack on my back. I twisted my ankle and fell. That fall was the injury that pushed my back over the edge. First I went to see a chiropractor. He did his adjustment magic but everything just seemed to worsen. He took more x-rays and told me I should see an orthopedic surgeon. I don’t remember the orthopedist’s name. He clearly found himself to be important and well known. He looked at my x-rays and advised me to have surgery. He said that the next time I took a fall, got in a car accident, or had some other minor trauma to my spine I was liable to lose bladder and bowel control. He said that if I left my spine untreated I would eventually wind up in a wheelchair. I went to a neurosurgeon for a second opinion. The neurosurgeon also found him self to be important and well known. Jay went with me to the appointment, so I could have another set of ears in the room. The neurosurgeon said I could probably postpone the surgery for a while, but that I would eventually need it. He didn’t offer any way of dealing with the ongoing pain. He didn’t even talk to me, he addressed all of his comments to Jay. I left that appointment angry and still in pain. He offered little hope for change. I called my old friend Agi for advice. She concurred with the orthopedist: it was time for surgery. There was at least some hope of improvement with this solution. I don’t know how long it took me to make the final decision, but on April 1st of 1997 I had a spinal fusion with bone graft and instrumentation. 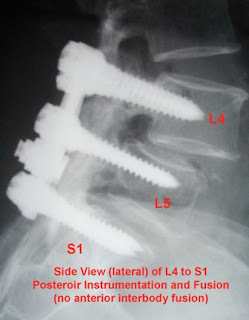 The orthopedist placed 6 titanium screws into my vertebra, two each into L4, L5 and S1. The screws are joined together by two long titanium rods that run along either side of my spine. The orthopedist shaved live bone from my right illium and laid the bone between the wings of L4 and L5, and L5 and S1. The surgery fused together my spine from L4 to S1 and is referred to as a spinal fusion with instrumentation. I think of it as if I just had a very large sacrum. I have no mobility in my lower back. All of my bending here arises either above L4 or below the sacrum. The image below is not my spine but comes from an online website. I once had copies of the x-rays of my own back, but they got left behind in one move or another. This is the closest image to my own surgery that I could find.